Happy Labor Day weekend! I don't know about you, but this long weekend couldn't come soon enough and even though I know it will be over in the blink of the eye, I am trying to make the most of these last days of summer. Since the Labor Day weekend marks the beginning of the Los Angeles County Fair, I decided to include a trip to the fair as part of the weekend festivities. Despite the fact that I am standing in front of one of the many game booths at the fair, playing games isn't really my cup of tea. Instead of winning a plush prize, you'll find me: wine tasting (of course), seeing the animals, and strolling through the retailers. Oh, and how could I forget about stuffing my face with fried food? That's one of the great things about the LACF, there's something for everyone! Usually we go to the fair towards the end of September, as things are starting to wind down, but this year we went on the opening weekend because the weather was cool this weekend and surprisingly the attendance rates are supposedly lower the opening week. Also, the wine tasting events that were held yesterday looked good and, to be honest, the wine tasting schedule usually dictates more than anything when we go! Because of the 'cooler weather" (it wasn't actually that cool, but 80 degrees is pretty cool for this time of year), I wore jeans and my new candy striped linen shirt from J. Crew. I've been wanting to wear this shirt, which I actually bought a month or two ago, all summer, but I somehow never got around to it. 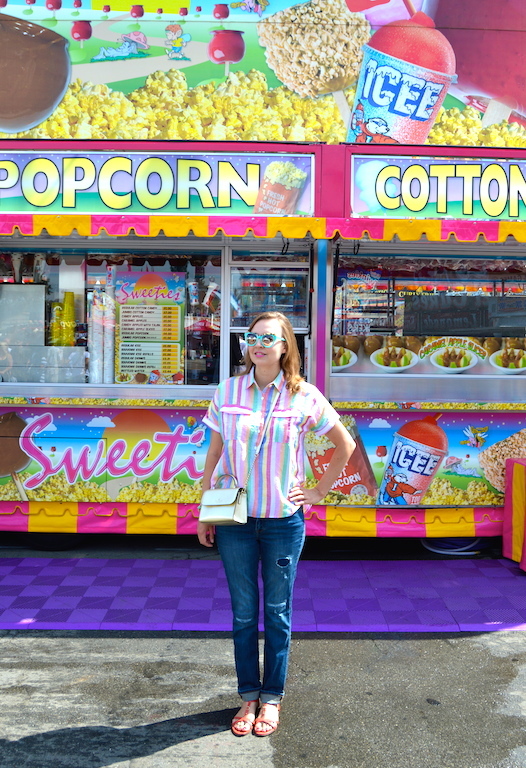 The pastel stripes definitely blended right in with all of the colorful candy vendors at the fair! Shirt: J. Crew short sleeve popover shirt in "candy stripe"
Perfect outfit for a day at the fair! I love your candy striped shirt! Such great colors! 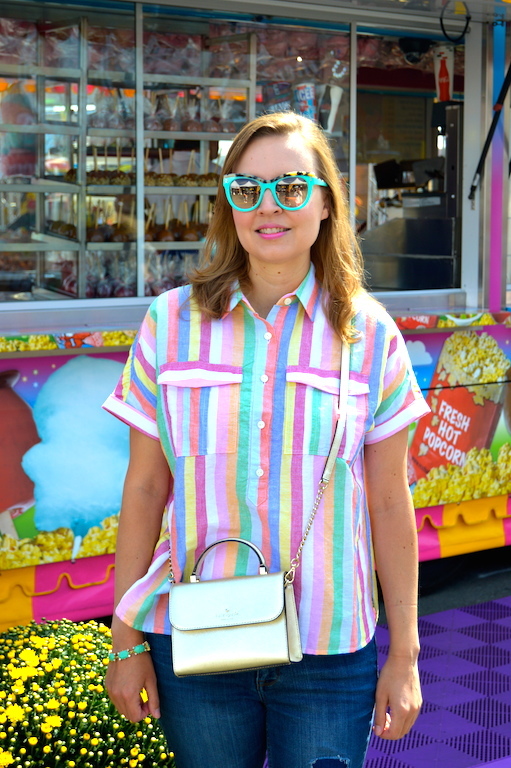 Pretty striped top and I just love how it compliments the fun fair backgrounds! I enjoyed seeing you in a jean look. Thanks to Hurricane Hermine we actually had some cooler temps this weekend, too. You always find the coolest and colorful places! The fair sounds so nice, and we have had that weather too, a bit nicer than 90. Love the striped shirt Katie and jeans! super cute outfit! love the top! Adorable look and colors! Have a lovely weekend Katie!